the essence of "odyssey" is its bassdrum. everyone who has ever listened to "odyssey" knows for what reasons the bassdrum is also known as kick among musicians. the kick just kicks and gives you the true kick. originally, this kick was a free sample derived from a keyboards-cd. after delta 16 had routed this sample through multiple devices, this kick kicks like no other kick does. 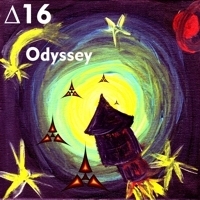 since then, delta 16 call it the "odyssey-kick". multiplexer`s comment: happiness is when the bass begins. there is nothing to add. to enjoy the "odyssey-kick" and the bass you really need excellent equipment. listening to odyssey via earphones may be possible but is honestly senseless.